← A van made out of brick? Living in such a compact vehicle with limited space and resources makes us much more aware of our consumption and waste day-by-day than when we lived in our house. On thinking of this new awareness of what we need to live our current lifestyle, it made me think of our van very much as a mini planet. We need to protect our finite and not always readily available resources. The effort and any payment involved in obtaining them is immediately connected with usage. 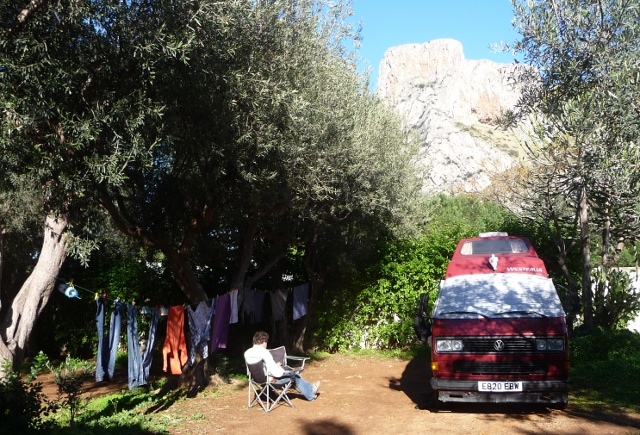 We are aware that driving an ageing campervan on long journeys isn’t the greenest thing we could be doing with our time, but we do try and live as greenly otherwise as local facilities and conditions allow. What do I mean by our resources? Petrol for travelling (and the heater if we use it) is probably our most expensive both in terms of cost and the planet. Our tank holds around 65 litres and the van does about 25 to the gallon. We use gas (LPG) for cooking and sometimes the fridge and our usage is minimal, 12 litres every other month or so. We use battery power for lighting, water pump and stereo. Mains power when we’re hooked up for charging and for the socket which powers laptops and fairy lights (and any other appliance should we have them). We only have one power brick and cable for the laptops, so can only use one on mains at a time, an issue now we have two machines again both with dodgy batteries! Our water tank holds 50 litres, which is used mainly for cooking purposes, so we are very conscious of how much we use and alert to when we need to top it up. We also have to consider the waste grey water tank (20 litres) so we know how much we use and what it looks (and occasionally smells) like. Campsites usually have waste water disposal and fresh water filling points. Some communities also provide this service for campervans. It is not always free in either case. Our wider water needs of course take place beyond the confines of our van. However, we are still very aware of how much we use and how much this costs. Showers are very often on a timed or by volume token system, sometimes this is adequate, sometimes generous, sometimes neither. We tend to use campsite facilities for washing up, hot water provision for this is a rarity. We use bottled water for drinking so this does rack up our plastics usage somewhat. Laundry is often our biggest challenge. Not every campsite offers washing machines and when they do they have been quite expensive. The cheapest we’ve used has been €3.50 for a large and quick brand new American style machine. The worst has been €6 for a small domestic washing machine for which you had to book a timed slot. I don’t like driers, which is just as well because they are rarely available. This does mean that you are more dependent on good drying days – shorter winter days and unreliable weather limit the chances of these – and somewhere to hang everything up (trees or poles on and around the pitch for the washing line). We also need to dispose of rubbish after nearly every meal. Not all campsites have convenient disposal areas, and many don’t have designated recycling bins. Towns and villages have mostly had communal rubbish bins and recycling collection points. 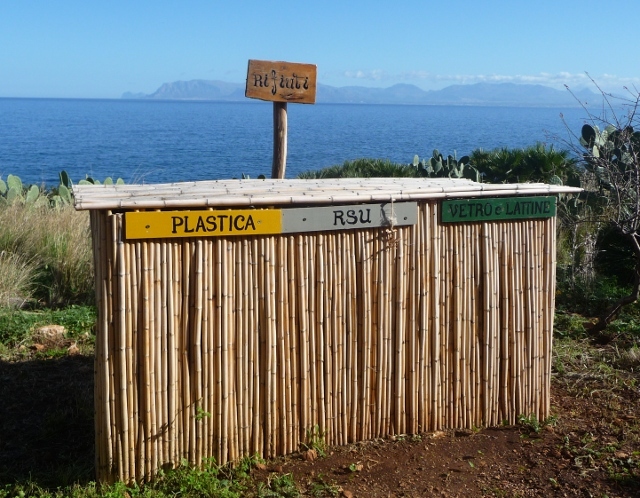 In southern Italy and Sicily, recycling facilities seem to be less obviously available and often the bins are misused. If we buy something new, it has to fit in somewhere convenient, to stack neatly or to replace something we’ve lost or broken. We’ve bought very few extra items on the trip. We are much more up for making do and mending, as some things are not readily available to replace. We buy food and drink little and often to top up our small fridge, drinks cabinet (supermarket wine carrier) and small cupboard spaces. We can’t bulk buy and this does mean we can’t always take advantage of special offers. We try to shop locally as far as we can on the road, and take advantage of the abundant seasonal produce on offer. We’d like to shop more ethically, but this isn’t something that we have seen obviously promoted to any great extent in the shops of the countries we’ve been to so far. There are just eggs full stop. Organic labelled foods are few and far between. During our trip we’ve become dependent on having more cash than we would otherwise have about our persons, especially in Italy. Smaller notes and change are a must to smooth the path of daily shopping and travelling, even for petrol. This helps us keep on top of what we’re spending and means no surprises on bank balances. When we are camped up we try and use our feet, our bikes and public transport for getting around locally as much as we can. This saves on petrol consumption, helps keep us trim and you meet more people too. This entry was posted in Personal stuff, Travel stuff, Van stuff. Bookmark the permalink.